It had been since Thanksgiving that traffic rolled along Southern Avenue in Laveen near 59th Avenue. There was a good reason for that: Crews needed to move a lot of earth to finish the first phase of a Loop 202 South Mountain Freeway interchange project and reopen this busy road. On Monday, traffic returned to Southern Avenue between 61st Avenue and 64th Drive. You can see it in the video above and slideshow below. It’s no stretch to say that the residents are thankful to be using Southern Avenue again. Some, including school bus drivers, waved at us as they passed today. Other than occasional overnight closures to complete a 125-foot bridge, Southern Avenue will remain open during phase two of the work. 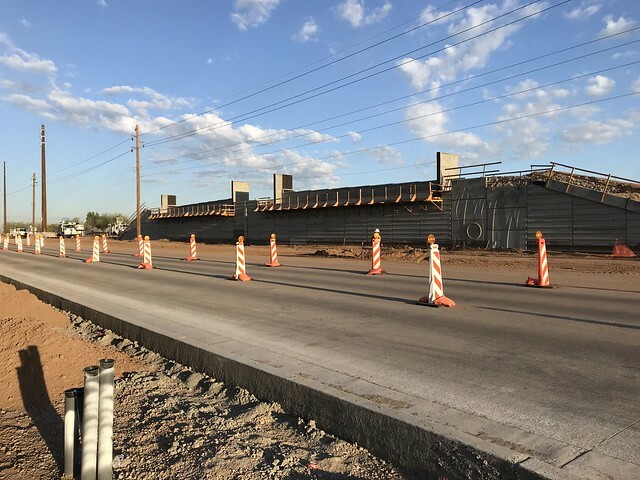 “While closing Southern Avenue was certainly impactful to Laveen motorists in the last few months, in the long run this freeway will alleviate some of the growing traffic congestion on local roadways,” said ADOT Resident Engineer Adam Brahm, who oversees the Salt River segment of construction on the South Mountain Freeway.